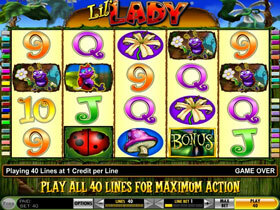 Lil Lady - 5 Reel, 40 Payline video slot by IGT. This is a very popular and loved game also known as the "Ladybug Game" featuring Stacked Wilds and Free Spins. Lil Lady is about a Lady Bug who lives in a beautiful country garden with all her friends. The characters are very lovable, the music and sound effects are also entertaining. 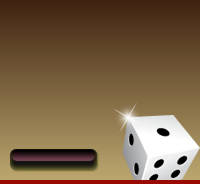 Play for Free or Real Money from 0.01 up to 5.00 per line bet and bet up to 5 coins per payline. The maximum win is $/£/€ 250000 of currency for a single bet. Lady Bugs, Snails, Butterflies, Trees, Flower, Mushrooms,Gardens and the regular high value cards Ace, King, Queen, Jack, Nine,Ten. The Lady Bug will substitute for all the other symbols to complete winning combinations but won’t substitute for the Bonus scatter symbols. The Stacked Wilds can line up to activate many simultaneous wins. The Lil' Lady Bonus Scatter symbol does not have to show up in a line on an enabled payline to win. The Scatter symbols appear only on Reels 2, 3 and 4. When 3 Scatters show up anywhere on Reels 2, 3 and 4 the Free Spin Bonus Round will be activated. The Free Spins Bonus Round begins with 5 Free Spins. During the Free Spins the Lady Bug Stacked Wilds and Lil’ Lady Bonus symbols can also be re-triggered which will award 5 more free spins. The maximum amount of Free Spins during a Bonus Round is up to 255 Free Spins. Lil Lady is a cheerful, comical game full of easy winning combinations! The graphics are comical and maybe the Lil Bug will bring that Lady Luck to you!